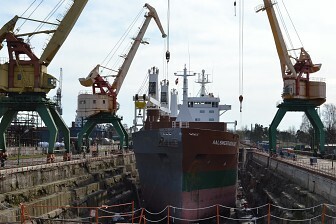 The Latvian shipyard Tosmares Kugubuvetava has reached an agreement with KHL-Company about payment of its debt and the latter will withdraw the insolvency claim it had filed against the shipyard, informs LETA. The board of Tosmares Kugubuvetava said in a statement submitted to the Nasdaq Riga stock exchange that an agreement had been reached with KHL-Company about the payment of the debt and KHL-Company will withdraw its request for declaring Tosmares Kugubuvetava insolvent. As reported, KHL-Company filed an insolvency claim against Tosmares Kugubuvetava on January 22 this year, and the court in the Liepaja city in south-western Latvia was scheduled to hear the insolvency claim on February 8. In the first nine months of 2017, Tosmares Kugubuvetava posted EUR 2.956 million in turnover at a 20.1 percent drop from 2016, and earned a profit of EUR 2,119, which is a multiple reduction year-on-year. Shares in Tosmares Kugubuvetava are quoted on the Secondary List of the Nasdaq Riga stock exchange. Latvia's Rigas Kugu Buvetava shipyard is the largest shareholder of Tosmares Kugubuvetava.